Tomorrow, November 19th is a big holiday in Belize, Garifuna Settlement Day!! 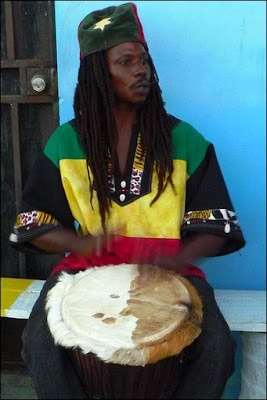 Festivities will be celebrated all over Belize starting with drumming all night tonight, especially in Southern Belize. According to tradition, the first Garifuna arrived in then, British Honduras (Belize) and then established villages along Belize's southern coast on November 19th, 1802. This day is now a national holiday in Belize, initiated by Thomas Vincent Ramos, celebrated with drums, dancing and pageantry. Andy Palacio, Belize's most famous musician on the international scene. He was the first musical artist from Belize to have a music video on international television. He received the award for "Best New Artist" at the Caribbean Music Awards in 1991, and was post-humously awarded the BBC3 Awards for World Music award in the Americas Category, in 2008. 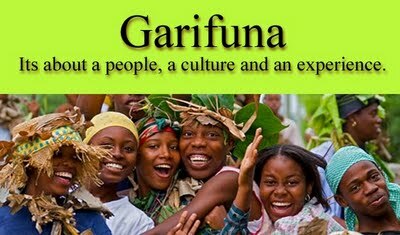 In recent history, Garinagu have thrown off their British appellation and encourage others to refer to them as Garifuna (Garinagu-plural). The Garifuna population is estimated to be around 600,000 both in Central America, Yurumein (St. Vincent and The Grenadines) and the United States of America. The latter, due to heavy migration from Central America, has become the second largest hub of Garifuna people outside Central America. New York has the largest population, heavily dominated by Hondurans, Guatemalans and Belizeans. Los Angeles ranks second with Belizean Garinagu being the most populous, followed by Hondurans and Guatemalans. There is no information regarding Garinagu from Nicaragua having migrated to either the East or the West Coast of the United States. Nicaraguan Garinagu are few. They are learning the Garifuna language and acquiring the different cultural aspects. Today, the Garinagu struggle to keep their culture alive; it is the devotion of the Garinagu to their roots which sets them apart from the other ethnic groups in Belize. While many Garinagu are professed Catholics, they have retained numerous traditions and rituals from their Afro-Caribbean heritage. Central to the Garifuna community is the belief in and respect for the ancestors. The Garinagu retain their powerful spiritual connection with past generations of any family group through a ritual called "Dugu". A Spiritual leader called a "Buyei" or shaman presides over family members, who travel from all over the world to gather at the dugu meeting place called a "temple". No expense is spared as fresh seafood, pork, fowl and cassava bread are prepared for days of healing, dancing, drumming and communing with the spiritual world. This spiritualism spawns a wealth of creativity among Garinagu in the form of music, dance and art. Punta Rock is a modern musical interpretation of a Garinagu cultural dance. The Punta dance accompanying the music - with its seductive movements and rhythmic beat - is Belize's most popular dance. Another favorite dance - the "John Canoe" - is performed during the Christmas season. The dancer wears a mask which resembles an English face topped by a hand-made hat similar to the English naval hats of the 18th century. The dance displayed the skills of warrior-slaves while mocking their British overseers. The traditional Garifuna colors are yellow, black, and white. Women often wear long dresses sewn from checkered material along with colored head pieces. Bright colors, distorted perspective and historical themes dominate the work of the many talented Garinagu painters. Hand made drums of cedar and mahogany, stretched with deer skin, continually pound the African beat in most Garifuna villages. Garifuna crafts include traditional cloth dolls, coconut leaf baskets and maracas made of calabash gourds. Traditional Garifuna foods are based on coconut milk, garlic, basil, and black pepper. Banana and plantain are grated, mashed, boiled or baked. Fish boiled in coconut milk, called serre, served with mashed plantain it’s called hudut and is a deliciously rich meal. Cassava, is a woody shrub or herb which, like potatoes, has tuberous roots. But unlike potatoes, the juice which lies between the fibers of the manioc root is poisonous. The secret of extracting the root, involves a two-day process. First, the root is dug out before daybreak. The skin is peeled off, and the root is grated into a mash on stone studded boards. This mash is placed into a wala, a long, narrow, loosely woven tube made of palm fronds. When stretched, the wala compresses the mash, squeezing out the poisonous fluid. The resulting dehydrated cassava mash is then sun dried and made into flour, which can be sifted and baked into flat round loaves called cassava bread. The course "trash" left from the sifting is baked black and simmered with ginger, sugar, and sweet potatoes into a favorite drink called Hiu. Source: Platinum RealEstate,Lehman, Jeffrey. Gale Encyclopedia of Multicultural America. 2nd ed., vol. 1. Gale Research, 1995. Thanks Linda for posting this article on the history of the Garifuna, it is very interesting, I learned a lot today. God Bless the Garinagu and Belize!! Linda, thanks for posting this, very interesting history. I did not know all this about the Garifuna. I will have to get back to learning about my country and its people. Please keep up the good work you are doing. I try as often as I could to read your website. God bless you and God Bless Belize, she needs it! Thank You Linda for putting this together. Happy Garifuna Day Everyone. For those who are unaware, this day signifies a lot for Belizeans. A wonderful day for Belizeans at home and abroad. I salute my Garifuna brothers and sisters at home and abroad. You have kept you heritage and culture alive even in the face of discrimination from other Belizeans. With hard work and perseverance,today you are on top of the world!! God is great my brothers and sisters, God is great!! Thank you for the Punta music and the great food; HAPPY GARIFUNA SETTLEMENT DAY, BELIZE. LONG LIVE Belize! Great article Linda! I learned a lot! Thank you for sharing! Very informative and well researched. Thank you. Looking forward to hear more from you. I am grateful for the write up but want to add that there are many more towns and villages considered Garinagau strongholds including (Seine Bight, Hopkins, Georgetown and Dangriga). Garifuna historians it is time to get to work, lets tell ourstory from our perspective. It may seem small but time has shown if you do not tell your story it becomes confusing even to you. What a gift to see Andy Palacio and Aurelio Martinez performing. Thank you for bringing this to us.